I will repay those who are kind to the poor. In yesterday's promise, we talked about how God says He won't forget all the love you have shown Him by loving others. 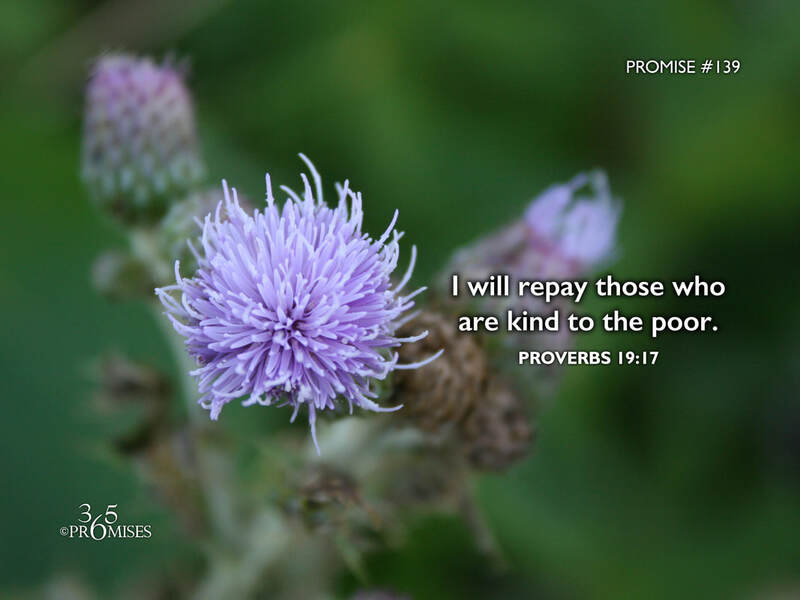 In today's promise, King Solomon writes in Proverbs 19:17 that God promises to repay us when we give to the poor. This Scripture actually says that when we give to those who are needy we are actually lending to the Lord. I can't think of a better person to have a business transaction with than our God and Father! There is an old saying that says "We can never out give God". My prayer today is that each and every one of us would see the incredible blessing there is for us when we are merciful to others just like our Heavenly Father is merciful to us. The whole point is not to give to others to get from the Lord, but it is such a wonderful thought that God sees our gifts to the poor as investments in Him and He promises to repay all that we sow in this life.